The suspects, aged 30 and 43, were charged Friday for association with terrorist criminals over the March 18 incident. PARIS: French anti-terrorism judges have charged two men suspected of involvement in supplying a weapon to the gunman killed at Paris's Orly airport after attacking soldiers, a judicial source said Saturday. The suspects, aged 30 and 43, were charged Friday for "association with terrorist criminals" over the March 18 incident, the latest in France which remains on a state of emergency after a series of deadly jihadist attacks. Both men are being held in custody, the source said. The younger one was also charged with arms possession related to a terror plot. They are both from the Paris area and lived close to the assailant, Ziyed Ben Belgacem, but neither of them had links with any radical Islamic movements, according to a preliminary investigation. The 30-year-old detained Friday is suspected of having given Ben Belgacem a revolver a few days before the attack, while the older suspect was present when it was handed over. The younger man admitted once in custody having been in possession of the gun and kept it at his home, before Ben Belgacem came to get it, a source close to the investigation said. Questioning of both of them revealed no further details about Ben Belgacem's plans, said the source. The Orly attack, which came a month and a half after a similar assault at the world-famous Louvre museum in Paris, bears the hallmarks of the Islamic State (IS), but has not been claimed by the jihadist group. Ben Belgacem was under the influence of drugs and alcohol when he attacked the capital's second busiest airport, according to judicial sources. 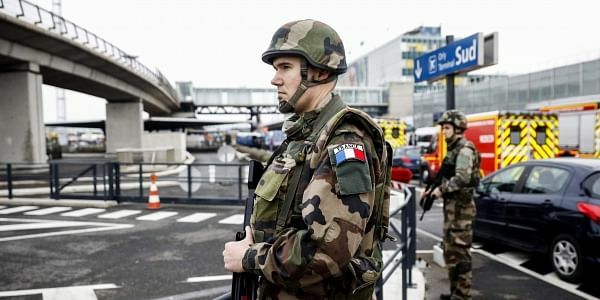 The 39-year-old, born in France to Tunisian parents, grabbed a soldier on patrol at Orly's southern terminal and put a gun to her head and seized her rifle, saying he wanted to "die for Allah". His father insisted his son -- who had spent time in prison for armed robbery and drug-dealing -- was not an extremist.